A website or a web store are two examples of applications that are often entrusted to an external hosting provider. To do so, it is very often recommended to call on the services of a Belgian or Dutch hosting provider. And there are good reasons to do so. Our CEO, Jonas Dhaenens, explained these reasons as a guest expert in the IT-magazine WINMAG Pro. What you get from a local cloud partner is usually much more than what you can expect from an overseas partner like Amazon.com, which typically requires you to figure things out on your own. For this purpose, you need to have in-depth expertise in IT or staff to take care of everything. 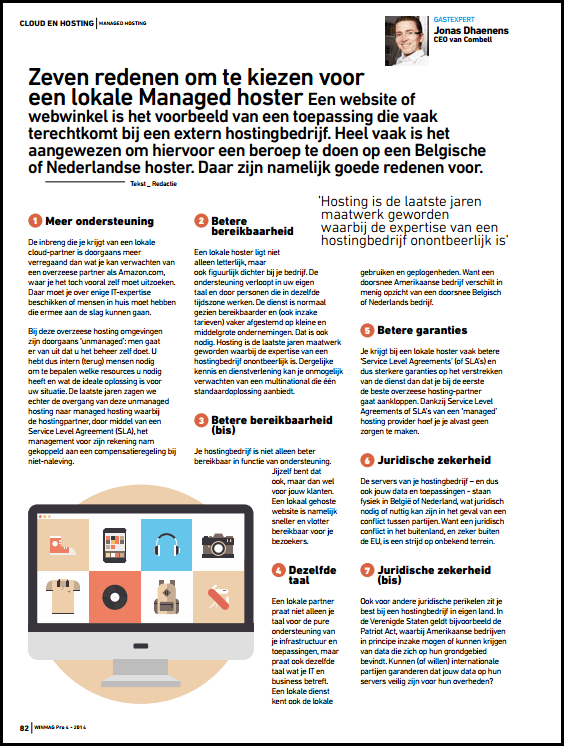 These overseas hosting environments are usually “unmanaged”: it is presumed that you will manage everything yourself. So, you need to hire people (again) to determine which resources you need and what the ideal solution is for your situation. In recent years, however, there has been a transition from these unmanaged hosting services to managed hosting services, while the hosting partner has started taking over the management by means of a Service Level Agreement (SLA), including a compensation system in cases of non-compliance. A local hosting provider is closer to your company, both literally and figuratively. Support is provided in your own language by people who work in your same time zone. Normally, the availability of the service is higher and is more often suited to SMEs (also price-wise). And that is also necessary. In recent years, hosting has become a bespoke service, for which the expertise of a hosting provider is indispensable. You cannot expect to get such knowledge and services from a multinational that provides only one standard solution. Your hosting provider offers higher availability as far as support is concerned. But your availability is higher too, for your customers. A locally hosted website is indeed much faster and Internet users can visit it much more easily. A local partner speaks your own language as far as the support of your infrastructure and applications are concerned, but it also speaks your same language as far as your IT and business are concerned. A local service also knows the local habits and customs. Because the average American company is very different from the average Belgian of Dutch company. A local hosting provider will usually provide better “Service Level Agreements” (or SLAs) and thus better guarantees on the provision of services than if you choose any overseas hosting partner. Thanks to the Service Level Agreements or SLAs of a “managed” hosting provider, you do not need to worry about anything. The servers of your hosting provider – and thus also your data an applications – are physically located in Belgium or the Netherlands, which may be legally necessary or useful in case of a dispute between the parties. Because getting involved in a legal dispute abroad (and certainly outside of the EU) is an awful journey into unknown territory. Going for a hosting provider in your homeland is also more beneficial for other legal reasons. In the United States of America, there is e.g. the Patriot Act, which enables US authorities to seize data that are stored in the USA. Can international providers guarantee that your data that are stored on their servers are safe for their government? And do they actually want this? Ever faster deliveries… do customers really want them?